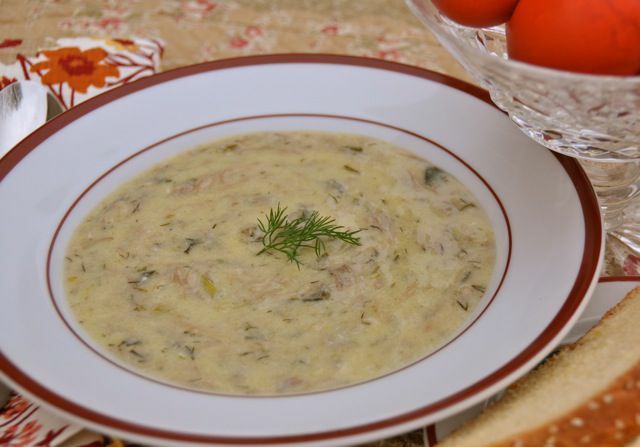 Mayiritsa Easter soup, μαγειρίτσα in Greek (pronounced mah-yee-REET-sah), is traditionally eaten only once a year to break the fasting of the Great Lent. The main Easter meal (on Easter Sunday) has typically been an occasion to slaughter a lamb or goat, and this soup was designed to use the leftover parts so that nothing went to waste. This soup is prepared on Holy Saturday and eaten after midnight church services. The soup is put on low heat to cook before leaving for church and eaten on returning home. Note: while there are multiple steps to this recipe, this Easter soup is broken down into workable categories to help you better plan for preparation and cooking. Wash the organs and set aside to drain. Cut the intestines lengthwise with scissors and clean well under running water. Rub them with coarse sea salt and the lemon juice, then clean again under running water. Bring a large pot of salted water to a boil and add the organs. Boil for about 3 minutes, then add the intestines and boil for another 5 minutes. Drain and chop into small pieces. Heat the olive oil over medium heat in a large, heavy-bottomed soup pot. Sauté the onion and green onion for 2 to 3 minutes. Add the meat and sauté until browned (a few minutes). Add dill, salt, pepper, and 10 cups of water. Bring to a boil, then lower heat to a slow boil and cook for 1 hour and 30 minutes. Add the chopped lettuce to a separate large pot of boiling water and boil for 5 minutes. Transfer to a colander to drain. After the soup has been slow boiling for 40 minutes, stir in the lettuce. Stir in the rice 10 minutes before the end of cooking time. Remove the soup from the heat. Beat the egg whites until frothy. Continue beating and add the egg yolks, the lemon juice, 1 tablespoon of water, and several ladles of the soup broth. The key is to beat continuously so the eggs don't scramble. Add the mixture to the soup, stir, and cover the pot with a towel. Let sit for 10 minutes before serving.